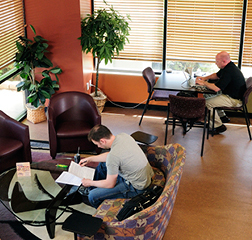 Jayhawk Central is a great place to grab some food or to get a study group together at the Edwards Campus. featuring a coffee shop and pizzeria. Enjoy an outdoor terrace and group meeting spaces with wireless internet. Please note all operations, except Sarpino's, are closed on July 4 and Labor Day. Sunday - Thursday: 10 a.m. to 2 a.m.
Friday - Saturday: 10 a.m. to 3 a.m.
Monday - Thursday: 5 a.m. to 7 p.m.
Friday - Saturday: 5 a.m. to 4 p.m.
Sunday: 6 a.m. to 4 p.m.